Thank you so much for looking at these Rad. I have some basic questions regarding when a planet conjuncts the sn. Generally when a planet conjuncts the sn there is a relive, fruition or combination of both that cannot be released until the second saturn return. Is this correct? Does this also mean that if there is a state of fruition that the "gifts" of that fruition will also dissolve at that time or that the person will no longer be working with these gifts? And specifically relating to timing when a planet conjuncts the sn and a planet conjuncts nn. In this case the person can be released prior to the second saturn return, but how does one determine this timing? Is it earlier if there is more than one planet conjunct the nn? Is it unique to each individual depending on their evolutionary state? 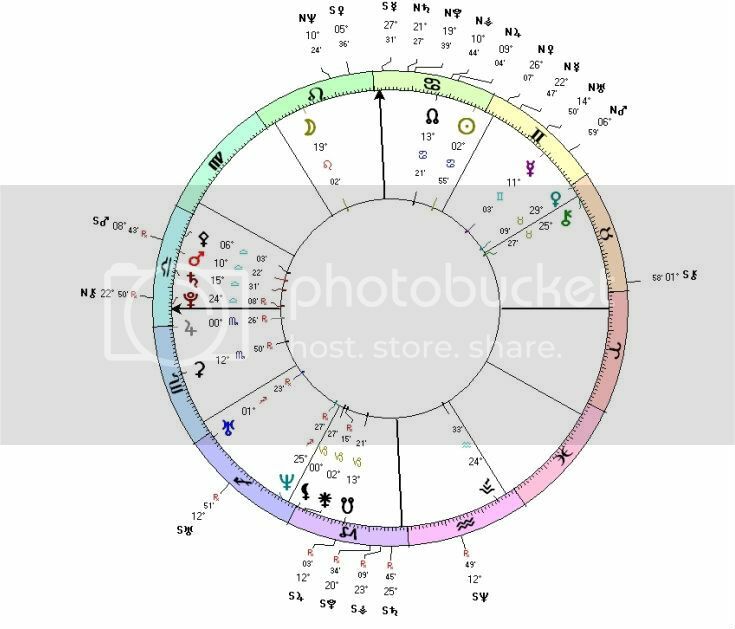 Generally are there any specific guidelines for determining the "release" when a planet is conjunct sn but there are also planet/s conjunct the nn? I have some basic questions regarding when a planet conjuncts the sn. Generally when a planet conjuncts the sn there is a relive, fruition or combination of both that cannot be released until the second saturn return. Is this correct? Does this also mean that if there is a state of fruition that the "gifts" of that fruition will also dissolve at that time or that the person will no longer be working with these gifts? The 'gifts' reflected in fruition do not dissolve. The karmic/ evolutionary requirement to act upon those gifts that will define the Soul's reality is that which can be released. The number of planets on the N.Node has no correlation to the timing of the release. An overall consideration / understanding of the entire chart, starting withe the EA paradigm, must be taking into account in order to know when that timing can occur. Thus, it is different for each Soul. The evolutionary state, of itself, is not a determinant in that consideration. As for some general guidelines: the transiting Lunar Nodes, and their planetary rulers relative to the natal Lunar Nodes and their planetary rulers, the transit of Pluto of course, and the transits of Saturn and Uranus. Within this the transits of the South and North Nodes of the planets that are the natural planetary rulers of the natal North and South Nodes of the Moon. Here is another chart example with a very potent signature of Venus Uranus opposition both semi/sesquisquare the nodes. Venus is also conj Chiron and square her Moon. She is first stage spiritual. First, the core dynamics within the soul has to do with social conditioning and judgments that she has deeply internalized leading to her hiding her actual nature for many life times. Her basic path in this life is to become completely honest with herself about her actual nature, not what she has been conditioned to believe. This will be facilitated via a naturally matriarchal oriented path – one that is deeply connected to nature and the feminine. Through that path she will be a teacher and eventually hold a position of spiritual responsibility for many other souls via the nature of the spiritual path that she has chosen (Saturn in 12th squaring nodes, nn ruler in 10th in mutual reception with Sun in 9th). Being trained and disciplined via such a path is a necessary step (Saturn relative to nn in 9th – matriarchal/nature based teacher/disciplineship). The Venus Uranus opposition in the second and 8th along with Venus being in a paradoxical placement that involves the Taurus/Scorpio archetpyes at first glimpse has to do with the dichotomy between self reliance, and within that self reliance being absolutely free to determine her own values and relationship to her body, sexuality, money etc – and the other side of where there is a deep longing and desire to merge with another on an absolutely penetrating level linked to the sexual/emotional needs that relate to the natural separating desires inherent within this soul. Venus linked to the gibbous sesquisquare to the sn in Capricorn in the 3rd, which is ruled by Saturn in Libra in the 12th squaring the nodes, implies that there was social conditioning and judgement about the nature of her own natural desires – and has thus suppressed them all the while entering into marriage with others who then became controlling and dominate over her – this being deeply invalidating at a core level since the intention has been to grow from relationships. She has completely lost herself and her own authority to these relationships and has overcompensated via osmosing the values, and the cultural beliefs of the partners she has had. Because of that there has also been a cyclic need to completely break free from any kind of commitment of any kind of the basis of needing to get in touch with her own freedom and essence (opposition to Uranus). And that Uranus in Sag in the second sesquiquad the nn implies the impulse to liberate from all kinds of conditioning linked to her intimate parternships in order to understand who she is at a core level. Thus prior lives where she has been at times completely alone, likely in the forest (sag, 9th). The reisistance to evolution via the sesquiquad, since the sequiquad implies attention to detail and a natural slowing down, focusing within, implies that there is a need for her to analyze the nature of her own relationships and the dichotomy between her own inner life, who she ACTUALLY knows herself to be, and who she becomes (which includes patterns of duplicity and people pleasing – third house relative to libra 12th) in her relationships. This will require discernment and discrimination (gibbous) about who she opens up to on a sexual level. It will also require her to include within her understanding of life (3rd/9th house) an orientation to sexuality that will support her to become more self aware of her own motives and the reasons behind her various past relationships. Given her evolutionary condition, she is evolving closer to a tantric path – and thus learning to limit her sexual involvement via that discrimination and eventually through that attract a partner that will demonstrate the desire to both totally commit and also support her own natural freedom. This may also imply evolutionary necessity will remove various partners from her life as well as attracting partners that do not stick around (Uranus in second in Sag relative to the 9th house nn – reflecting her own need for freedom. In opposition to Venus = throwing off any dynamics that create imbalance). All this would be to ensure that she develop the necessary self reliance and does not become too conditioned/limited via her partnerships. Is this an accurate understanding of these signatures? Also, will there be the need for this soul to go back and forth between the extremes of partnership and being alone for her entire life until she resolves what needs to be addressed? Thank you so much. Extremely accurate. One thing to include in this understanding about her intimate relationships, over many recent lifetimes, is her becoming confused by others in the beginning of the attractions. In one to many lives she has been attracted to 'silver tongue' devil types who have all the right words in the beginning, the very words demonstrating the kind of reality that she would want for herself with another. These are the types who know how to manipulate others relative to the types of words that they use to do so. And once a commitment has been made to such a type soon after the actual reality of that Soul becomes revealed in a variety of ways where the actual reality is vastly different than the initial presentation of them self. Thus, in all those lifetimes in which that dynamic has been in place she has ended up feeling totally disillusioned by way of intimate relationships. The antidote for such a dynamic, the Venus/Uranus opposition, is to simply been platonic friends with whomever she is attracted too that has the possibility of the deep, permeating, type of relationship that she needs. And to do that at a minimum of six to eight months. The point of this is that is the person that she feels those kinds of attractions too are NOT WHAT THEY SEEM TO BE, HOW THE REPRESENT THEMSELVES, they will do something that will expose their actual reality and agenda in that timing. If the person is whom they seem to be then they will remain that way. This is how she can then 'test' who is real, and who is not. And then make the appropriate decisions. One thing to include in this understanding about her intimate relationships, over many recent lifetimes, is her becoming confused by others in the beginning of the attractions. In one to many lives she has been attracted to 'silver tongue' devil types who have all the right words in the beginning, the very words demonstrating the kind of reality that she would want for herself with another. Is this indicated by the semi square between the nn in Cancer in the 9th and Venus in Taurus in the 8th in relation to Mars in Libra in 12th squaring the nn, and that Mars being ruled by that Venus? And would this also imply a similar dynamic of her partners having literally left her (via 9th house, travel) after the "got" what they wanted from her? From these signatures it seems that she has been a part of very particular cultures in the past that by their very nature subjected her to a wide exposure of intimate partners and often limiting and subjectifying marriages and at the same time kept her isolated and locked in a certain social role. The energy of a geisha comes to mind - I'm not assuming specifically that, however is it accurate to say that there has been some sort of role of that nature in prior lives? The signature is the 8th House Venus that is the ruler of all the Libra in the 12th which is reinforced by the Mercury in Gemini, duplicity, trining all that Libra, and then reinforced even further by the S.Node in Capricorn in the 3rd which of course is being squared by all that Libra including Saturn: skipped steps. This is a carried over lesson that she has yet to learn. What if you have Mars/Venus in a balsamic state? Your quest is for a timeless ideal relationship. That which reflects timelessness, that which is natural, not conditioned. Is monogamy, a one-to-one relationship, that which is most natural to the species? What is the natural and actual instinct in the species? The answer is that there are no absolutes. So, if you take Mars/Venus in the balsamic phase, it means that that individual is seeking an entirely different kind of relationship, a relationship with the divine, first and foremost and learning how to see the divine in their partner, first and foremost, thus effecting unconditional love, not conditional love. In this state, you are in a timeless relationship. If you have Mars/Venus in a balsamic phase, it simply means, relative to culmination, that you are destined to meet many people throughout your life with whom you have had prior live dealings, people with whom you are culminating or finishing relationships with. It means that the older you become in this life, if that is your condition, that you will begin to meet new people, people who you will not be allowed to be in an intimate relationship with, but with whom you will establish seeds that will grow into future lifetimes together. WOW--I am so glad to read this, I guess I didn't see it before. It sheds a great deal of light into my life. With the energy of the eclipse, I have been having loads of insights into my patterns, which brings up a question relative to my own chart, with the intent to increase my own EA awareness, and hopefully others as well. If one has Mars and Venus in balsamic phase, semi-square, and Venus is conjunct Pluto and Uranus, and Pluto and Uranus are in balsamic phase to each other, but Venus is in new phase to them (in the 4th with the SN of Mars) and Mars in the 5th, could it be that this soul, in terms of romantic intimacy, and relative what I just mentioned, would it be a conscientious choice to stay out of committed relationships in this life, relative to the statements above in bold. In other words, it is best not to get into significant relationships to allow the balsamic phase to complete more easily?? Also, does it help the soul to embrace their polarity of Mars to further actualize the dharmic relationship to the current life, and thus meet those new people who they can 'plant seeds with for future lives together'? Maybe I am just repeating what you already said here? I just am really beginning to get into the meat of this whole EA paradigm--into the objectivity. "If one has Mars and Venus in balsamic phase, semi-square, and Venus is conjunct Pluto and Uranus, and Pluto and Uranus are in balsamic phase to each other, but Venus is in new phase to them (in the 4th with the SN of Mars) and Mars in the 5th, could it be that this soul, in terms of romantic intimacy, and relative what I just mentioned, would it be a conscientious choice to stay out of committed relationships in this life, relative to the statements above in bold. In other words, it is best not to get into significant relationships to allow the balsamic phase to complete more easily??" It entirely depends on the total evolutionary and karmic background between the two individuals. It may be necessary to be intimate in order for the culmination to occur for example. "Also, does it help the soul to embrace their polarity of Mars to further actualize the dharmic relationship to the current life, and thus meet those new people who they can 'plant seeds with for future lives together'?" Yes, because in so meeting 'new friends', and keeping it as friends, this helps the Soul objectify to itself it's emerging evolutionary needs in relationships. Thanks Rad. This all is very clarifying. This next posting is about planetary aspects that has been condensed by Adina Mather from the old message board. (Q): When there is a huge stellium of planets in a chart all conjunct within a 10-degree orb and another planet aspects that stellium, there can exist more than one type of aspect, i.e., quintile and square. What is the rule governing this? Does one incorporate both aspects within their analysis? I have Sn in 20 deg Virgo, Pluto 26 deg Virgo, Venus 0 deg Libra (all 2nd house with Virgo on the cusp), Uranus at 5 and Mercury at 6 deg Libra, My Saturn is at 6 deg Taurus (10th house w. Aries on the cusp). So I have a Uranus/Saturn Full phase inconjunct and a Saturn/Mercury Gibbous phase inconjunct...clearly a trauma signature. If yes, then I assume that I should consider Saturn inconjunct the Stellium planets (and perhaps inconjunct the Sn)? Should I tie in all the planets in the stellium (incl the Sn) in interpreting the trauma signature, since all the planets and the Sn forms a bridge to the inconjuct Uranus/Saturn aspect? I also have Mars 17 deg Cap conjunct Moon at 19 deg which I previously thought only aspected my Nodes and Pluto. I guess I should now add the other planets in the stellium to that Sn/Pluto aspect? Technically, no if one uses a ten degree orb. Relative to that stellium of planets and the S.Node this would symbolize that your Soul has already been trying to work on, and through, various traumas that have preceded this life, and yet there is still work to be done on those traumas from the past in this life. This is measured by the movement of the S.Node itself. The remaining parts of those traumas are then symbolized by Pluto and Venus that are within that ten degree orb relative to the S.Node. Pluto is balsamic to that Node as is Venus, yet Venus is in a new phase relative to Pluto. This is the symbolism that reflects some parts of the trauma have worked upon in such a way that your Soul wants to move on, the new phase, yet other parts remains to be worked upon, the balsamic phase. This dynamic is then restated by Venus balsamic to Uranus yet Uranus is a new phase relative to Pluto. Mercury is also a new phase relative to Venus, Uranus, and Pluto, yet balsamic to the S.Node. Thank you soo much for the step-by-step phase analysis. Truly valuable and I will try to absorb it deeply. This is a question, in part using my own Pluto/Mars configuration, but I hope it’s general enough and applicable to any student as to provide relevancy to the board. 1) when Pluto is for example in a Crescent phase Square with a planet whereas the Sn is in a First Quarter phase Square to that same planet? In general, is there anything that can be said as to the dynamics of how this configuration has operated in the past? 2) When this configuration is within the same phase (this is me), let’s say Pluto trine Mars (but before the exact aspect) within the First Quarter phase and Sn trine Mars (but after the exact aspect, i.e. the Sn is moving away from the exact aspect to Mars), is there anything that can be said as to how these configurations have operated in the past leading up to this life?